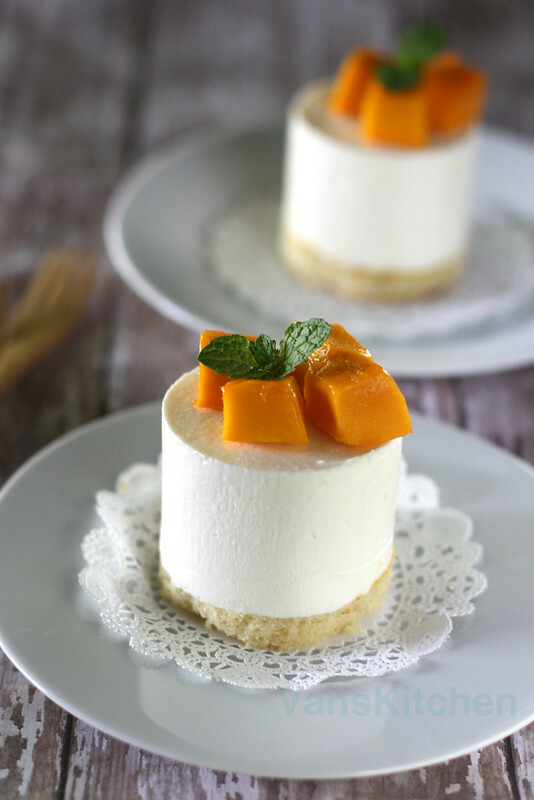 ♥Watch my video how to make this no-bake orange cheesecake with mango on Youtube. It is always so much fun to play around with baking to me. When it comes to a family event or a special occasion, a nice dessert to bring the party to a close is great. 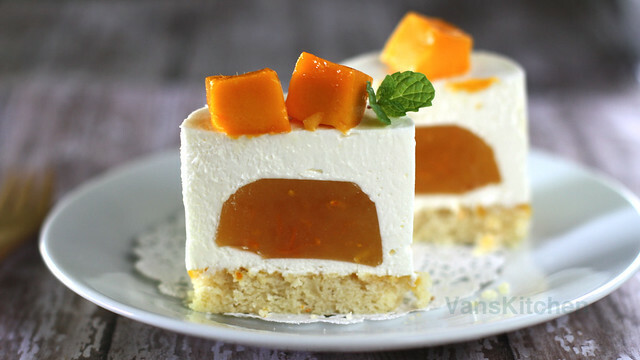 This no-bake orange cheesecake with mango is not hard at all, but it’s very fun to make and the cake turns out awesome. 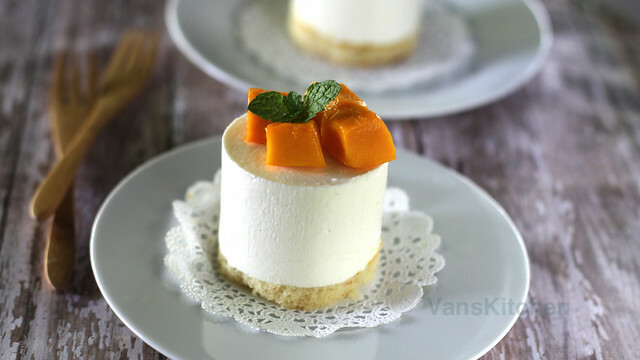 Each bite of the cake is a nice surprise with the great combination of soft cheese mousse, jelly orange, and the light texture of sponge cake. If you love to bake, but get tired of simple desserts, this original recipe is from my home to yours. dd this hot mixture into the soften gelatin mixture and stir. Pour it into the mini bowls. Let them cool completely, then put in the fridge. The next day, use a spoon to take them out. Cut the sponge cake into 6 circles, ⅓-inch thick. Place the sponge cake in the mold, and brush the sponge cake with mango jam. Whisk 100g of cold heavy cream until it forms into soft peaks. Place it in the fridge. Beat the cream cheese until it’s soft and free of lump. Add sugar bit by bit, and beat until the sugar dissolved. Add yogurt, and mix well. Bloom the gelatin on half of the heavy cream at room temperature. Let it soak into the liquid. Place the remaining room temperature heavy cream in the microwave for 30 seconds, or until it boils. Pour it into the soften gelatin mixture, and mix well to ensure that there are no lumps of undissolved gelatin. Add the gelatin mixture into the cream cheese cake batter. Mix well. Then gently fold the cold whipped cream into the mixture. Put the mixture into a piping bag. Pipe the mixture into the mold, just enough to cover the bottom. Place the orange jelly on top. Then continue piping the mousse to cover the jelly. Level and smooth the top.Then cover and refrigerate for 4 hours (or overnight) to firm. To take the cake out of the molds, use a hot towel cover around the mold to melt the fat for 30 seconds or so. Then push the cake down while you lift the mold. Decorate with mango cubes and mint leaves.